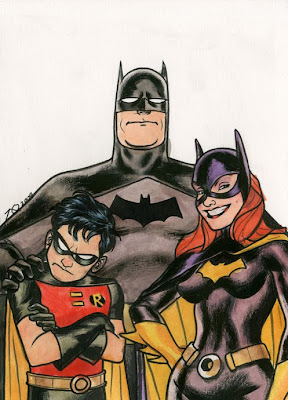 To herald in this year's winter solstice, Hub Comics, my local comics shop, decided to hold a small gallery show highlighting local artists in their interpretations of Batman and friends. "The Dark Knight on the darkest night" was the idea, and though we aren't quite there yet (the solstice is this Monday), the opening for the show was yesterday evening. Maris and I did two complimentary family portraits for the event. Above is mine. You can find Maris' awesome counterpart image (soon) on her blog, here. In other news, this past week saw the release of 'Amazing Spider-man no. 615, which arrived in stores this past Wednesday. 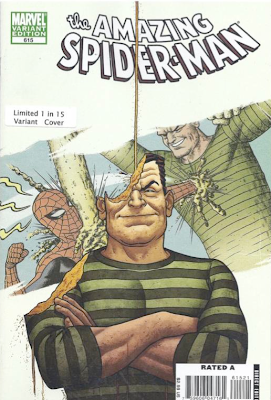 I illustrated a variant cover for the issue highlighting the Spider-man villain, Sandman. That's cool. What's cooler? My friend Paolo Rivera illustrated the main cover. It's bitchin'. Check it out on his blog here. That is all. Enjoy the rest of your weekend, folks! Have a great holiday, Joe and Maris!